The Italian peninsula, measuring 116,372 square miles (roughly the size of Nevada), exhibits great diversity of mountains, plain, and hill country, which frequently exist together in the same locale (see map 1). Situated in the middle of the Mediterranean, Italy consists of two distinct areas determined by the Alpine and Apennine mountain ranges. One of these two regions, the Po Valley of northern Italy, is roughly triangular in shape. It is bounded on the north by the Alps, on the south by the Apennines, and by the Adriatic Sea to the east. Since during the fifth and fourth centuries b.c. Celtic tribes (termed Gauls by the Romans) from continental Europe crossed the Alps and took up residence throughout the Po Valley, the ancient Romans called this region Cisalpine Gaul, meaning "Gaul on this side of the Alps." This plain is good for agriculture and is bisected by the Po River, the largest river of Italy, which flows west to east for 418 miles, receives the runoff from both mountain ranges in numerous streams, and empties into the Adriatic. Since the land nearest the Po was often marshy, the earliest human inhabitants of northern Italy tended to settle in areas away from the river. Settlement of the mountain slopes and plain promoted the exchange of commodities peculiar to each environment. The arc of the Alps separates northern Italy from continental Europe. Yet despite their height, they never constituted an insuperable barrier to early man, but several passes were routinely used for travel to and from southern France to the west and the central Danube to the east. Although the Po Valley was the last area of Italy to succumb to Roman arms, its geographical ties to continental Europe played an important role in the prehistory and early history of Italy by its reception of new cultural influences and peoples beyond the Alps and transmission of new ideas across the Apennines. During the past two million years, the world's climate has undergone major warming and cooling trends as reflected in the advance and retreat of glaciers. Prolonged cold climatic conditions have fostered the growth of enormous ice sheets, whose movements have left their marks on the earth's surface. For example, the lake beds of Maggiore, Como, and Garda below the Alps in northern Italy were carved out by glacial action. Furthermore, glaciers are composed of such massive amounts of water that their expansion and contraction have drastically affected sea levels worldwide. Thus, at the height of the Wurm glaciation periods (i.e. four intervals occurring during the past 125,000 years) the level in the Adriatic dropped so far that dry land at times extended as far south as Ancona. Conversely, in interglaciation periods the sea level rose as glaciers melted, and parts of what are now the Tyrrhenian coast and the eastern Po Valley were submerged beneath the sea. Plant and animal life throughout Europe and Asia fluctuated in accordance with these geological and climatic changes, and Paleolithic hominids (Homo erectus, Homo sapiens neanderthalensis, and Homo sapiens sapiens) adjusted to regional conditions by hunting animals and gathering edible plants, by using fire, caves, and animal skins to shelter themselves from the rigors of cold weather, and by fashioning various utensils and tools out of wood, animal bone or horn, and stone.4 Under such conditions human existence was extremely hard and precarious and differed little from that of the animals upon whom early people depended for food, clothing, and tools. The landscape was very thinly populated by small bands of our hominid ancestors, who were often obliged to change their abode frequently in their pursuit of deer, bison, mammoth, and other animal populations. Those dwelling near major bodies of water also supplemented their diet with aquatic and marine life. Human survival depended upon close cooperation within the group. As in hunting and gathering societies in different parts of the world studied by modern anthropologists, the adult males were probably responsible for hunting big game and making tools, while the women stayed close to the home site, watching the children, gathering edible plants, berries, and nuts, and performing other tasks. This general pattern of life prevailed across Europe and Asia during much of the Paleolithic Age (c. 400,000-10,000 b.c. ); and although the remains of hominid culture during the Old Stone Age are rather scanty in Italy, the same must also have applied to its prehistoric hominid inhabitants. The country's mountains furnished numerous caves suitable for human habitation, and the Lessini Mountains north of Verona in the Po Valley contained large flint deposits which were constantly worked by prehistoric miners for making tools. The glaciers of the last ice age gradually melted around 12,000-5,000 b.c., and ushered in higher sea levels and milder climatic conditions throughout the Mediterranean. In the Near East, in the area often termed the Fertile Crescent, the end of this period also witnessed one of the most important developments of human history: the so-called agricultural revolution, perhaps more accurately termed the agricultural transformation (Redman 1978, 2 and 88 ff. ), during which people began to support themselves by systematic agriculture. Since despite this major transition from hunting and gathering to agriculture the earliest farming peoples continued to fashion their tools from stone, the term Neolithic or New Stone Age is used to distinguish this period of human culture from that which had gone before. Moreover, since people could quite often grow more crops than they consumed, the existence of an agricultural surplus led to significant population growth, the division and specialization of labor, and incipient trade between communities and regions as surplus commodities of one sort were exchanged for others. The concatenation of these factors brought into being the first towns of the Near East; and in the course of time human settlement along the great river valleys of the Nile and Tigris-Euphrates resulted in the rise of the two early civilizations of Egypt and Mesopotamia, as complex political and social structures developed out of the need for people to cooperate in constructing and maintaining irrigation works that exploited the agricultural potential of these river basins. The idea and practice of agriculture gradually spread westward from the Fertile Crescent and Anatolia in the eastern Mediterranean through the Balkan peninsula and thence to Italy, perhaps arriving around 5000 b.c. Exactly how this process of diffusion occurred is still unknown, but one route by which agriculture was introduced into Italy is suggested by archaeological finds in Apulia. In 1943, aerial reconnaissance of northern Apulia by the British Royal Air Force, designed to collect information about military air fields and railway traffic, disclosed peculiar dark crop circles. Following the conclusion of World War II, these were investigated and found to be associated with ditches surrounding Neolithic sites (Stevenson 1947; Bradford 1950; and Bradford 1957, 85-110). Agriculture therefore could have been introduced into Apulia by enterprising farmers from the opposite Balkan coast in search of new land to cultivate. From this region, agriculture may have gradually spread into other areas of Italy as the farming population grew and brought more land under cultivation, or as indigenous hunters and gatherers learned the art of agriculture from farming settlements. From aerial photography, traces of over two thousand Neolithic sites have been detected in an area of 1,650 square miles in the Tavoliere plain around Foggia. This indicates that Apulia during the fifth and fourth millennia b.c. supported a substantial farming population organized into many small villages. The latest of three successive settlements at Passo di Corvo is the largest Neolithic site discovered thus far not only in Italy but in all of Europe, measuring 500 by 800 yards. Carbon 14 dating indicates that this man lived around 3500-3000 b.c., which makes him approximately as old as the earliest civilizations of Mesopotamia and Egypt. Moreover, unlike the mummies from ancient Egypt who had their internal organs removed when embalmed, the body of the Ice Man is almost fully preserved, and scientists have begun to study his internal anatomy in detail. He stood about five feet two inches tall and weighed about 110 pounds. Although his age at time of death was initially estimated at twenty-five to forty years, subsequent analysis of bone and blood vessels has shown him to have been forty to fifty years old and beginning to suffer from degenerative arthritis. He had brownish black hair, wore a beard, and would easily blend into the local Alpine population today if put in contemporary dress. The hair on his head is only three and a half inches long, demonstrating that the people of his culture regularly cut their hair. His body also bears several marks: a cross behind the left knee, stripes on the right ankle, and three sets of short vertical parallel lines to the left of his spine on his lower back. At first these marks were thought to be tattoos, but further examination revealed them to be cauterized cuts, possibly intended to counter the pain of arthritis. The Bronze Age of Italy, roughly coinciding with the second millennium b.c., exhibits not only more advanced metallurgical technology but also more widespread use of metal and continuous contacts with the Bronze-Age peoples of central Europe and the eastern Mediterranean.6 Bronze is a metal alloy formed by adding a small amount of tin to copper. The result is a harder metal, which melts at a somewhat lower temperature, is more fluid than molten copper, and is therefore superior for casting into molds. The major problem, however, is the relative scarcity of tin deposits (Maddin, Wheeler, and Muhly 1977). Although small tin deposits might have been located and mined out in various areas in ancient times, one major source of tin that was probably exploited during the Bronze Age was Cornwall in southwestern England. After being mined and cast into ingots, the tin could have been transported along the major rivers and land portages from northern to central Europe and the Mediterranean. This would have brought into being a complex interlocking network of commercial contacts; and given the considerable demand for tin among the Bronze-Age civilizations of the Aegean and Near East, the growth and prosperity of Mycenaean civilization c. 1600-1200 b.c. may have been in part the result of Mycenaean involvement in the central Mediterranean segment of this tin trade. This surmise can be further supported by the parallel trade in amber, which has been found in the Mycenaean shaft graves and probably reached Greece from the Baltic by a sequence of overland and Adriatic travel (Harding and Hughes-Brock 1974). The distribution of Mycenaean pottery of the fourteenth and thirteenth centuries b.c. revealed thus far can serve as a rough indicator of the degree to which the more highly developed civilizations of the eastern Mediterranean during the late Bronze Age interacted with the prehistoric cultures of the central Mediterranean (Taylour 1958, Vagnetti 1970 and 1982, and Harding 1984, 244-61). The most plentiful finds of late Mycenaean pottery have been made at a number of sites on the Ionian and Adriatic coasts of Italy and in eastern Sicily (especially at Thapsus, a trading post situated on a promontory not far to the north of the Great Harbor of Syracuse), whereas the Tyrrhenian coast of Italy has so far yielded only small amounts of Mycenaean potsherds (e.g., the small island of Vivera in the Bay of Naples). This situation, however, is likely to change as more Bronze-Age sites in the latter area are carefully excavated. Some remains of Mycenaean pottery have been found at Luni sul Mignone, a site located about twenty miles upstream from the coast along the Mignone, which flows south of Tarquinii into the Tyrrhenian Sea. At this site Swedish archaeologists uncovered three building-like structures dating to the late Bronze Age, one of which measured 13 feet wide and 138 feet long. All three structures were dug down into the tufa rock surface to a varying depth of four to six feet, and the walls above ground consisted of irregularly shaped stones piled one on top of the other and not bound together by any kind of mortar (Potter 1979, 37-41 and Drews 1981, 146-47). Since Luni sul Mignone is situated on the northern edge of the Tolfa-Allumiere Mountains of southern coastal Etruria, a region rich in copper, it is possible that these curious structures and the presence of Mycenaean pottery testify to the exploitation of mineral deposits and commercial interaction with the eastern Mediterranean during the late Bronze Age. As had been the case during the preceding Copper Age, the Bronze-Age sites of the Po Valley, especially during the second half of the second millennium, were heavily influenced by the Transalpine culture of central Europe. Throughout much of the Po Valley, cremation replaced inhumation as the standard way of disposing of the dead, and this practice clearly entered northern Italy from the Urnfield Culture of the Danube. This innovation has been the subject of much speculation. Was this major transition brought about by the exchange of ideas mediated through trade, or by the influx of new people, or by both these means? Besides funerary customs, the pottery and metalwork in the Po Valley of the late bronze age also exhibit new features similar to the those in the cultures of central Europe. Sites along the Apennine edge of the Po Valley, which were first investigated by L. Pigorini at the end of the nineteenth century, have been collectively termed the Terramara Culture, taking its name from a local Italian word meaning "black earth," which refers to the fertile mounds of dark soil produced by prolonged human habitation. Like the lakeside settlements farther north, Terramara structures were erected upon wooden platforms in order to avoid the hazards of flooding in the river plain. Perhaps the single most intriguing site of the late and final Bronze Age in Italy (c. thirteenth to eleventh centuries b.c.) is that of Frattesina located in the eastern part of the Po Valley. By prehistoric standards it was quite large, 700 by 190 yards, an area of 27.5 acres, and its remains show that it was an industrial community that refined metal, fashioned deer antler into tools, and produced colored glass beads, making it the earliest known site in Italy to manufacture glass. Ivory, amber, and fragments of ostrich eggs have been uncovered there as well, testifying to external commercial contacts. Frattesina can therefore be viewed as a prehistoric forerunner of Spina and Hatria, two important commercial sites located near the mouth of the Po, to be discussed in the next chapter. The progressive and innovative character of Bronze-Age northern Italy is further demonstrated by the fact that during the thirteenth century b.c. the spring safety pin was invented, probably in the area between Lake Garda and the Austrian Alps. Termed a "fibula" by modern archaeologists from its Latin name, the pin was henceforth used throughout antiquity to fasten at the shoulder or chest a garment wrapped about the body. Fibulae are therefore often found in graves, and the changing decorative style of their catch-plates provides archaeologists with valuable information for dating and concerning possible artistic influence. While the material culture of the Po Valley developed in response to influences from central Europe and the Aegean, peninsular Italy during the late Bronze Age lagged somewhat behind for the most part. Inhumation continued to be the funerary practice of this region. Although agriculture doubtless remained the mainstay of human subsistence, other evidence (the occupation of mountainous sites not conducive to farming, the remains of cattle, sheep, pigs, and goats, and ceramic vessels used for boiling milk and making cheese) indicates that pastoralism was also very widespread. This suggests that transhumance was already a well-established pattern of human existence. In fact, since the material culture of central and southern Italy was relatively uniform at this time, it has been conjectured that this so-called Apennine Culture of c. 1600-1100 b.c. owed its uniformity in part to the migratory pattern characteristic of ancient Italian stockbreeding. The carved Egyptian scenes of these so-called peoples of the sea show them not only in boats but also on land with wagons, women, and children, suggesting that this abortive invasion of Egypt involved some kind of migration. Much scholarly effort has been vainly expended in trying to identify the groups mentioned in this text. Suffice it to say that whatever was responsible for the collapse of the Mycenaean and Hittite civilizations, the end of the second and the beginning of the first millennia b.c. witnessed major changes in the cultural, linguistic, and political geography of the eastern Mediterranean. Archaeology reveals that in mainland Greece the destruction of the Mycenaean palace-centered states and economies was followed by a drastic decline in the material culture and the abandonment of many sites. In fact, historians have traditionally labeled the period c. 1100-800 b.c. the Greek dark age, characterized by village societies headed by local chieftains, from which the city-state eventually arose. The unsettled conditions of the late second millennium b.c. might have extended as far west as eastern Sicily. Coastal sites exposed to sea raids were abandoned, and the inhabitants occupied defensible positions of the interior, such as Pantalica near Syracuse (Holloway 1981, 107-14). It is also noteworthy that at the close of the Bronze Age the major site in the Lipari Islands met with violent destruction and was reoccupied by people from the Apennine Culture of Italy. The most important technological advance which came in the wake of the collapse of the Bronze-Age civilizations of the eastern Mediterranean was ironworking. Iron ore is much more plentiful than copper and tin and even has a lower melting point, but the methods necessary to extract iron from ore and to work it into a much stronger metal are far more complex than bronzeworking. Simple smelting produces only an unusable iron bloom, which has to be further refined by repeated hammering and controlled heating. The Hittites had already mastered this technology during the late Bronze Age, and with the collapse of the Hittite kingdom in the twelfth century this knowledge was dispersed among other people, thus spawning the beginning of the Iron Age. Iron metallurgy did not reach Italy until the ninth century b.c., and even then it was two or more centuries before iron displaced bronze as the most commonly used metal. Thus, archaeologists date the beginning of the Iron Age in Italy to c. 900 b.c. ; and although the Italian Bronze Age is generally assigned to the period c. 1800-1100 b.c. and is subdivided into early, middle, and late phases, the 200-year interval between the late Bronze Age and early Iron Age has been labeled the Final Bronze Age. During this period the practice of cremation spread south of the Po Valley and is attested at numerous sites throughout the peninsula. Since this cultural tradition developed into the Villanovan Culture which prevailed in Etruria and much of the Po Valley c. 900-700 b.c., modern archaeologists have devised the term "Proto-Villanovan" to describe the cremating cultures of the Italian Final Bronze Age. As might be expected, the spread of cremation throughout the peninsula has been the subject of much speculation and has been variously explained:7 (a) cultural interaction between the Terramara Culture of the north and the Apennine Culture of the south to produce a composite culture of the Final Bronze Age; (b) the extension of Terramara cremating people and their culture to the south beyond the Po Valley; or (c) the migration or invasion of new people from the Danubian Urnfield Culture. The fact that some of the earliest urnfield sites of peninsular Italy are located on the coast (e.g. Pianello in Romagna and Timmari in Apulia) is interpreted by some archaeologists as an indication that cremating people had come into Italy by sea, and that their migration was part of the larger upheaval which affected the eastern Mediterranean at the end of the Bronze Age (so Hencken 1968, 78-90). On the other hand, the same data can be explained in terms of indigenous coastal settlements adopting new cultural traits as the result of commercial interaction with foreigners. In any case, by the end of the Final Bronze Age inhumation had reemerged as the dominant funerary custom of southern Italy, but cremation continued to be an integral aspect of the Villanovan Culture of northern and much of central Italy. Was the widespread practice of cremation during the Final Bronze Age a passing fad, so to speak, adopted and then abandoned by the indigenous peoples of the peninsula, or was it introduced by new peoples who were eventually absorbed into the inhuming tradition of the south? This puzzle may serve as an instructive illustration of the limitations of modern archaeology in examining prehistoric peoples solely from the surviving remains of their material culture. With the advent of the early Iron Age in Italy in the ninth century b.c., regional differences begin to manifest themselves in the archaeological record, probably reflecting in some degree the linguistic and ethnic diversity which later characterized pre-Roman Italy in historical times. For example, to take funerary customs, for which archaeological data are the most plentiful, inhumation predominated in the region east and south of an imaginary line drawn between Rimini and Rome, whereas cremation was the most prevalent burial custom west and north of this line. The inhabitants of the latter area placed the ashes in a biconical urn, covered it with an inverted bowl or helmet, and deposited the vessel in a pit grave (see fig. 1). This culture, which was common throughout Etruria and much of the Po Valley, takes its name from Villanova, a hamlet near Bologna in southeastern Cisalpine Gaul, which was the first site of this type excavated by Count Gozzadini during the1850s. By the middle of the eighth century b.c. the Villanovan Culture of Etruria was evolving into what soon became the Etruscan civilization, while the Villanovan Culture of the eastern Po Valley developed into what archaeologists call the Este Culture. Linguistically, the former was characterized by a non-Indo-European language whose origin and connection with other known languages are still enigmatic. The tongue of the Este Culture, Venetic, belongs to the Italic family of Indo-European languages.. This development may illustrate once again the limitations of archaeological data, for if, as seems likely, the Etruscan and Venetic languages were already established in their respective areas at the beginning of the Iron Age, these two populations, though linguistically distinct, for a time shared a common material culture. 1. For general surveys see Whatmough 1937; L. Palmer 1954, 3-49; Devoto 1978, 1-72; Salmon 1982, 1-39; Penney in CAH IV. 1988, 720-38; Wallace 1998; and Baldi 1999, 118-95. See n.1 of chapter 5 for references to major collections of texts. 2. For the overall problem of correlating archaeological finds and the emergence of various languages see Renfrew 1987 and Mallory in Blench and Spriggs 1997, 93-121, which treat this matter in reference to the Indo-European family of languages. See Drews 1988b for this question in reference to the prehistory of Greek. See Dench 1995, 186 ff. 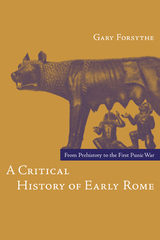 for this issue in reference to the early inhabitants of the central Apennines. 3. For the problem of correlating funerary remains with society as a whole during historical times of classical antiquity see Morris 1992, 1-30. 4. For general but detailed treatments of the prehistoric peoples and cultures of Italy, see Trump 1966; Barfield 1971; Potter 1979, 30-51; Holloway 1981; and MacKendrick 1983, 1-27. For the prehistory of the Mediterranean as a whole, see Trump 1980. 6. In addition to the works cited above in n.4, good treatments of the Bronze and Iron Ages of Italian prehistory are to be found in Hencken 1968, 27-96 and the essay by Peroni (containing further bibliography) in Ridgway and Ridgway 1979, 7-30. 7. For a general survey of this question, with further modern bibliography, see Fugazzola Delpino in Ridgway and Ridgway 1979, 31-48. 2. Archaic Italy c. 800–500 B.C. 8. Evolution and Growth of the Roman State 444–367 B.C. 9. Rome’s Rise to Dominance, 366–300 B.C. 10. Rome’s Conquest and Unification of Italy, 299–264 B.C.